Party hub, command station, dinner table—why kitchen islands rule. Every night, my kitchen island is covered with after-school snack plates, my dinner prep, homework, and—despite my scolding—everybody’s backpacks and workout bags, even my own. Sometimes I wonder why I did not choose a kitchen with a door to shut my mess out and their mess in, but like so many other food-possessed Americans, I wanted an open-plan kitchen that mingles living spaces and food preparation. And at the center of that kitchen, I wanted a large, multi-purpose island. The island is a metaphor for what I want a kitchen to be: an anchor in the home, a place to gather around the daily rhythm of food preparation, a semipro workstation loaded with appliances, and a stage for the off-off-off Broadway show called “Dinner” that runs in my house most nights of the week. I’m not alone: According to a Houzz survey of households that have recently completed, are working on, or are planning a kitchen renovation, 39 percent are adding an island (which, of course, doesn’t include those that already have one). It wasn’t always so. The kitchen island is a modern phenomenon—the ultimate expression of the kitchen’s move from the literal back of the house to the center of the home. Over the past century, the kitchen was “transformed from a drab, dingy, out-of-sight and out-of-mind place to the focal point of social interactions with friends and family,” says Juliet Kinchin, curator of modern design in MoMA’s department of architecture and design, who curated the museum’s 2010 show, “Counter Space: Design and the Modern Kitchen.” Kitchens take up much more space in a modern home than in those of the past, and the island as a luxury statement pops up all over media: Take the Kardashians’ sometimes-double-islanded kitchens, where the sisters hash out their grievances. As my husband and I undertook our remodel with architects Chadbourne + Doss, we considered a giddy-making array of options (see “6 Upgrades for Your Island,” facing page). We set our countertop of smooth, dark soapstone off with a giant raw brass sink, inspired by one that René Redzepi has in his home kitchen, and opted for tons of storage for appliances with a low, strong drawer. We planned flat file drawers to help keep clutter at bay. Even with all of the storage, we’re not mess-free: Sweatshirts, packages, and headphones end up on the counter almost every day, reminding me that, for all the many uses of the kitchen island—workstation, control panel, stage—it is in the end still a table, one that holds our family and friends close around it. Break up an island with playful bits of display using open shelves or storage trays. In this Venice Beach, California, kitchen by Kim Gordon Designs (above), glass cabinets above the island showcase decorative pieces while capturing and reflecting light. With their Bar Block, which sits atop an island (below), Henrybuilt offers sculptural ways to keep a cook’s most essential tools right within reach. Beautiful wooden drawers and cubbies slide in to stash knives, cutting boards, and everyday dinner essentials. A beautifully designed kitchen island sink, like the raw brass number from Texas Lightsmiths that author Sara Dickerman selected for her Seattle kitchen, functions like a bit of burnished jewelry in the room. 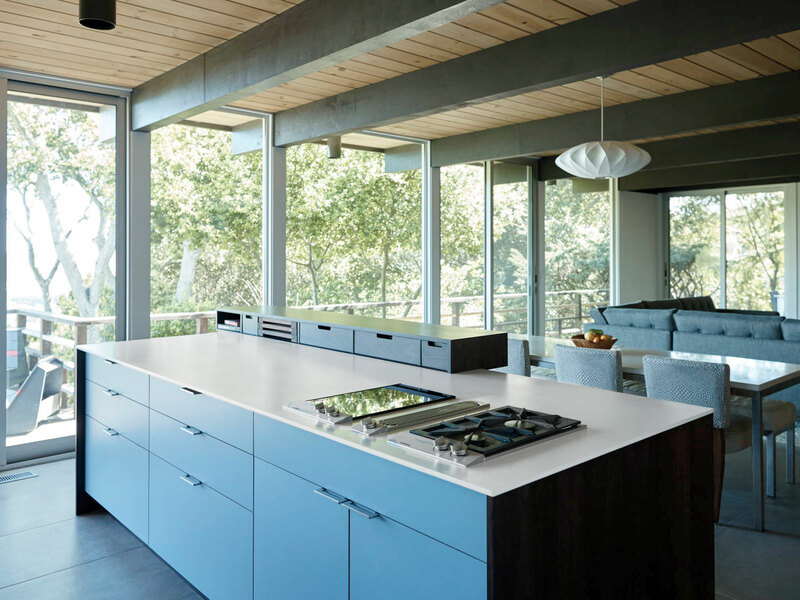 Built-in cooktops, such as the induction and gas ranges in this Marin County kitchen designed by Henrybuilt (below), allow cooks to face their audience. Got lofty ceilings? Consider adding a sculptural element with a high-end hood. In traditional European households of some means, there is usually a large worktable in front of the hearth or (in the late 19th century) a cast-iron stove. For these upper-income homes, kitchens are behind closed doors, and servants do the cooking. A factory-inspired interest in efficiency sweeps American homes. The freestanding Hoosier cabinet, first manufactured in 1898, incorporates storage space and a pull-out work surface. The Frankfurt Kitchen, designed for public housing homes by German architect Grete Schütte-Lihotzky, takes kitchen efficiency to new heights with elements like pull-out garbage bins in the cabinets and flour drawers made of oak to resist mealworms. Frank Lloyd Wright designs a kitchen for Nancy Willey, a Minnesota client who asks for a kitchen that would let her stay in touch with guests as she prepared dinner. A pass-through window hinted at the open kitchens that would follow. Open-plan kitchens with modern appliances become more commonplace, with islands attached to fitted cabinets at pass-throughs and peninsulas. Designers play with unusual jet-age shapes and candy-colored finishes. Julia Child’s The French Chef popularizes the notion of cook-as-entertainer, introducing the idea that a cook could stand at the range and talk with her guests, the freestanding kitchen counter serving as both workstation and stage. 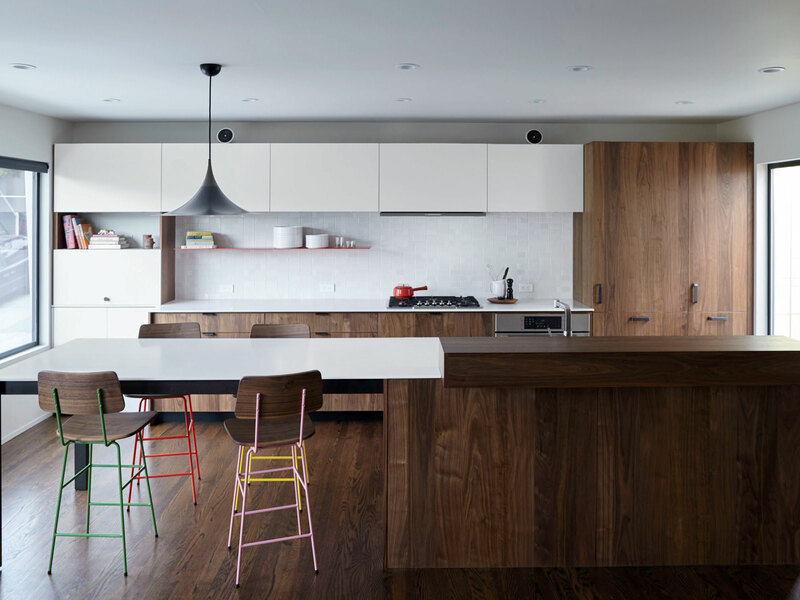 Countercultural, communitarian, and DIY sensibilities are reflected in more open displays of cooking tools, along with more open floor plans. Kitchen islands begin to proliferate, along with jungle-y canopies of house plants and dangling pot racks. When Food Network premiers its all-day programming, fascination with professional cooking soars. American kitchens become more professionalized, with restaurant-style ranges, stainless cookware, and ventilation. Maximalist islands pack in every kitchen function—sinks, dishwashers, ranges, and drawer-style refrigerators. Large islands with few functions other than as a workspace and place to gather (in other words, a table) return.